South Africa is putting its weight behind research into carbon capture, with the recent launch of the South African Centre for Carbon Capture and Storage. The centre was launched in Johannesburg as a private/public/international partnership in late March 2009. It will oversee the compilation of the so-called carbon atlas, which will identify and rank potential carbon dioxide storage sites, and drive the development of carbon storage technology in the Southern African region. The R25-million (US$2.7-million) centre is tasked with tapping into the vast South African expertise in mining and mineral resources and applying it to the commercial implementation of carbon dioxide storage. It is also intended to help facilitate the move from fossil fuels to renewable and nuclear energy. Present at the launch were representatives from South Africa’s national Department of Minerals and Energy, the Norwegian Ministry of Environment and Development, the British High Commission, South Africa’s Central Energy Fund, and the South African National Energy Research Institute (Saneri). Representatives from financial partners, such as coal producers Anglo Coal and Xstrata Coal, power utility Eskom and fuel manufacturer Sasol were also in attendance. In 2008 a group of high profile South African companies, each of which have much to gain from proper handling of greenhouse gases, banded together to identify suitable sites for carbon storage. These will be published in the work-in-progress carbon atlas. The R2-million ($210 000) project, under the leadership of Saneri, uses current geological information to pinpoint potentially suitable underground storage sites. The atlas is the collaborative work of Sasol, Eskom, the Petroleum, Oil and Gas Corporation of South Africa (PetroSA), mining giant Anglo American and Saneri. The atlas will rank potential storage sites according to a range of factors, such as storage capacity, proximity to industrial centres, and transportation pipelines. Work started in September 2008 and an initial assessment of South Africa’s storage potential is due for publication in early 2010 by the Council for Geoscience and the Petroleum Agency of South Africa. The complete atlas will be ready by mid-2010, says the Department of Minerals and Energy. 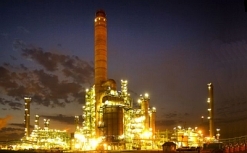 According to the department, the first test injection of carbon dioxide is planned for 2016, while a pilot plant is likely to be up and running by 2020. The first places to look, says Tony Surridge, senior manager for fossil fuels and acting CEO of Saneri, would be where gas, oil or coal has already been mined. The spaces left behind would theoretically be ideal for carbon capture and storage, which involves the collection of carbon dioxide before it escapes into the atmosphere, compressing it under immense pressure into a liquid form, and then injecting it into deep underground structures. These may be depleted oil and gas mines, coal seams, or deep saline aquifers – below-surface water-bearing formations of porous rock, sand or gravel, filled with salt water and therefore useless for agriculture or drinking. Aquifers are viewed as important potential carbon dioxide sinks because they tend to be large and close together, and may be capable of storing great volumes of the gas. Because of the depth of the geological structures and the resulting pressure, the carbon dioxide will not revert to its original gaseous form, and will be easily absorbed by rock. Furthermore, say scientists, the risk of it escaping is minimal. There is also the potential application of compressed carbon dioxide being injected into geological formations to help increase production from coal beds or oil and gas reservoirs. South Africa derives most of its power from the burning of coal, and is rated as one of the African continent’s biggest carbon culprits – with emissions approaching 400-million tons of carbon dioxide annually, it contributes about 1% to total global emissions. The country pledged during the Climate Change Summit held in March 2009 to stabilise greenhouse gas emissions between 2020 and 2025, keep them steady for up to 10 years and then start a decrease. And with a number of new coal-fired power stations on the drawing board, it is vital that plans be put into place now to deal with the future increase in emission of greenhouse gases. While carbon capture involves capturing greenhouse gases before they can escape into the atmosphere, it is equally important that they are stored in a suitable place. Surridge says that up to 60%, or 249-million tons, of South Africa’s carbon emissions could be almost immediately locked away in storage, technology permitting. However, it is also important to remember that carbon storage is not intended to replace strategies for increasing energy efficiency, and that steps to reduce greenhouse gas emissions must still be regarded as a priority.